I was going to copy and add my own, but the truth is you'd all be better served by going to the source of f-Laws and I don't have to plagiarize or quote. f-Laws are a series of common management flaws that seems to permeate today's companies. I encourage everyone who works with more than a couple of people to read the big book or even the FREE little book. Example - Word for word copied from the Little book. The more important the problem a manager asks consultants for help on, the less useful and more costly their solutions are likely to be. Consultants begin their engagements by gathering very large amounts of data, much more than can be transformed into useful information. No wonder! Their fees are proportional to the amount of time they devote to a problem, not to the amount of good that they do. The most successful consultants are the ones who are smart enough to see what managers want and give it to them after an extended effort, and do so in long, impressively formatted reports. They provide sanctions for a fee. The principal finding obtained by all studies conducted by consultants, regardless of the issues involved, is the need for more study. The success of a consultant’s effort is not measured by the amount of good it does for the client, but the amount of good it does for the consultant. Executives are seduced by data – the more they have, even if it’s useless, the more it makes them feel in control. The CEO or someone else very senior usually hires the expensive consultants. Who is going to challenge the CEO’s decision? Consultants set themselves up as experts. This provides the executive with another hiding place. “If the expert says so who am I to disagree”? Consultants - unlike the rest of us - do indeed manage to escape being accountable. The higher their fee, the less accountable they become. The more complex and costly their solutions, the more unlikely it is that they’ll be challenged. Who’s going to want to point out that some senior executive’s decision to hire consultants has been a huge waste of money? The best organizations, by the way, are more likely to use internal consultants, form employee problem-solving teams or hire customers and suppliers to solve problems for them. 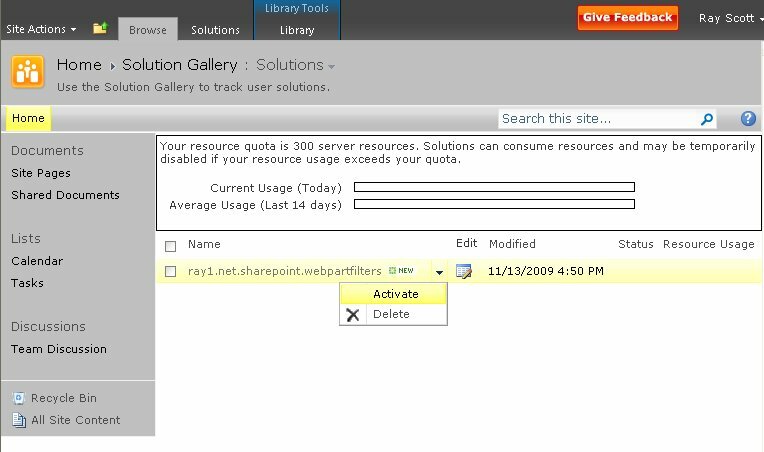 SharePoint 2010 beta first impressions. Maybe it's my scifi interest, but I think SPF 2010 & SPS 2010 roll off the tongue nicer than WSSv3 & MOSS 2007. After installing Win2008 and SQL2008, I launched the SP installer. The package extracts and you're presented with an SQL2005 type menu with Prepare/Install/Other Info. 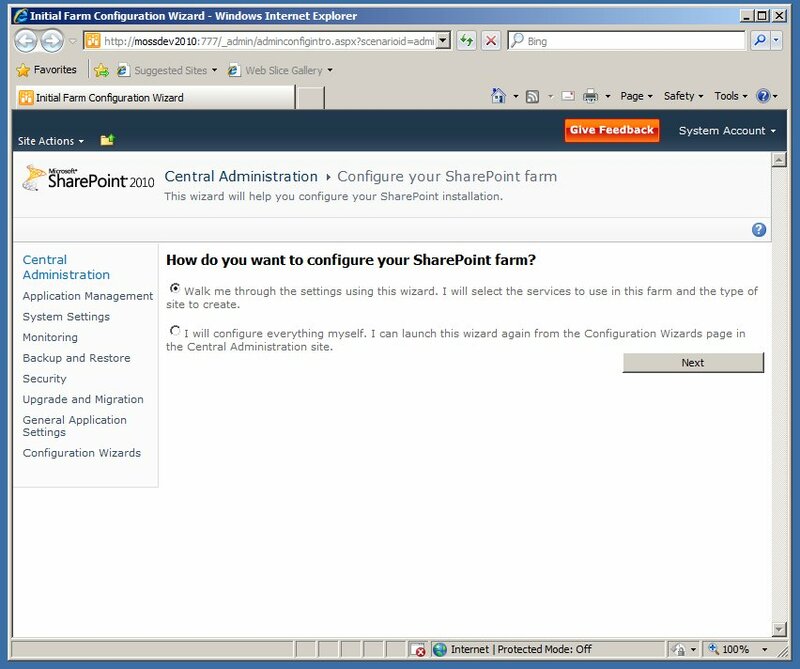 I skipped the reading and went directly to "Install SharePoint Server" and it failed because IIS 6 Compatibility Prerequisite was missing. This time I clicked "Install Software Prerequisites" and it installed quite a few more things. Google'd KB970315, downloaded and installed the Hotfix. the setup asks for a pass phrase to secure the farm. 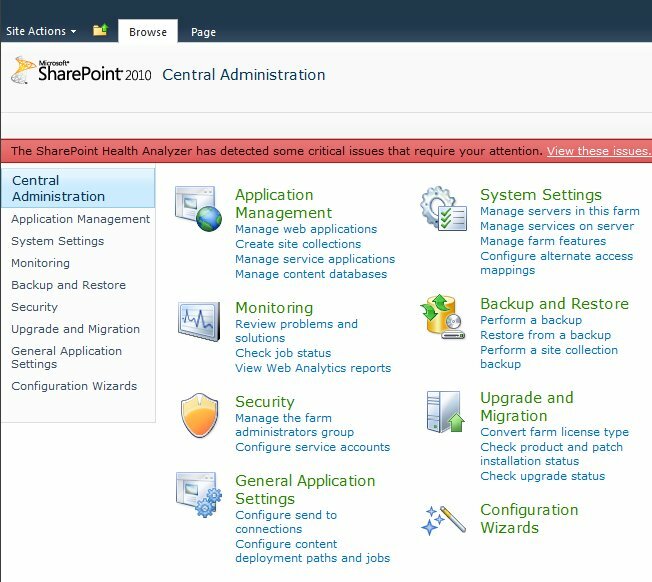 there's now a Wizard option to guide you through the Services configuration. 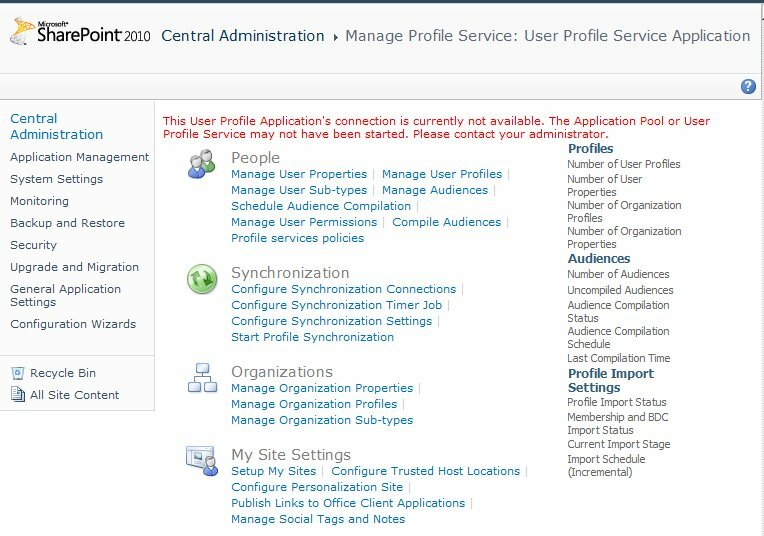 Central Administration, its all new and it has pretty icons like a Control Panel. 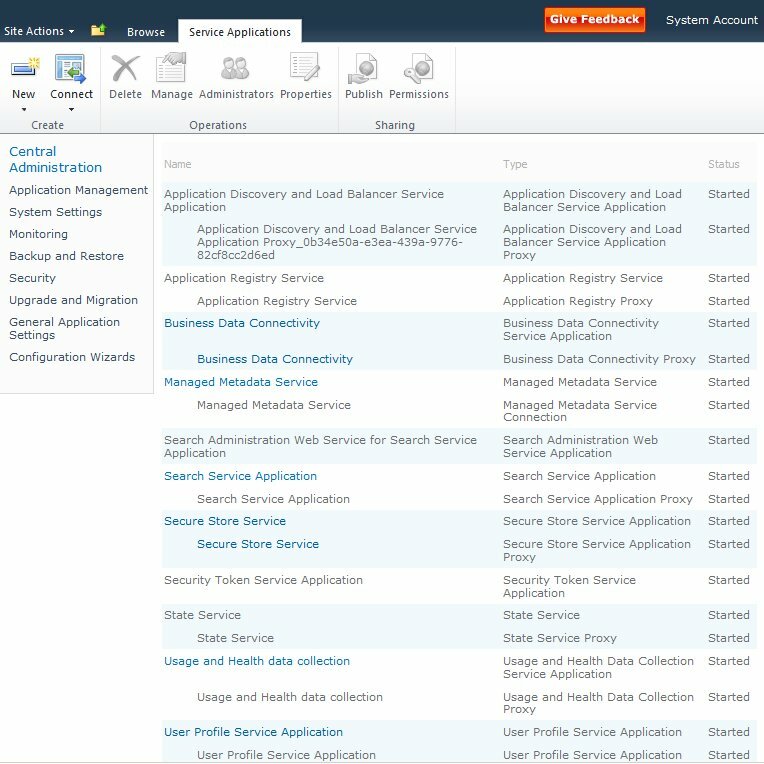 Let's add some user accounts and start using it... the Shared Service Provider doesn't seem to exist anymore and in its place is the much more logical Service Applications Management screen. User Profile Service Application is my guess for adding users. tried replacing the attribute with enableUnsecuredResponse, that didn't work... I noticed other security nodes didn't have this attribute so I commented them all out and it worked after an IISReset. 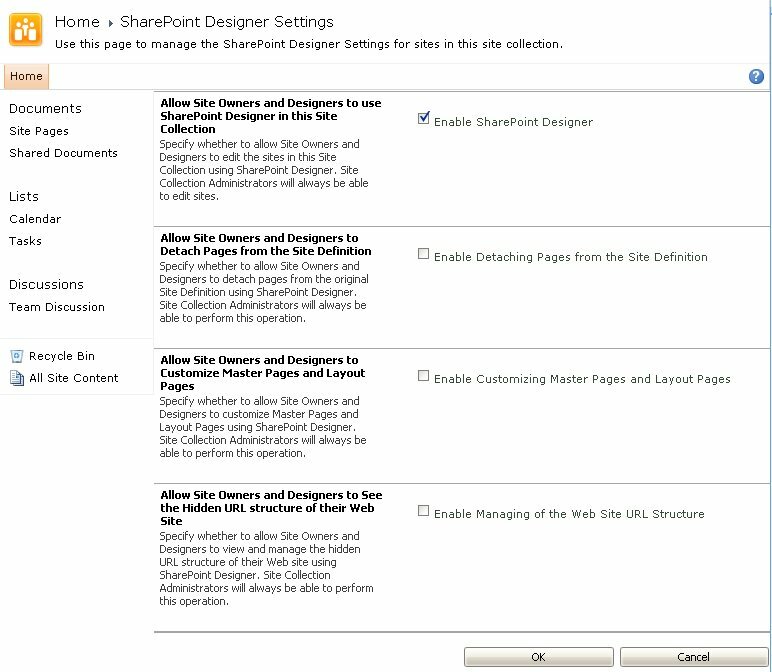 SharePoint Designer Settings, now I don't have to blanket disable SPD access! 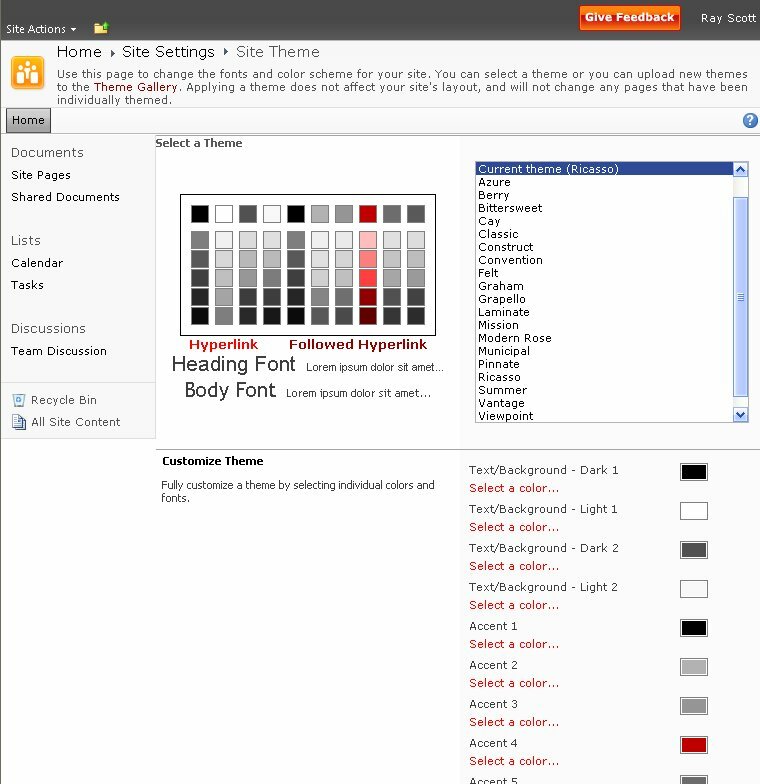 All in all SharePoint 2010 is more logically laid out and has a refreshing dynamic look. I'll delve in to SP2010 more in the future. 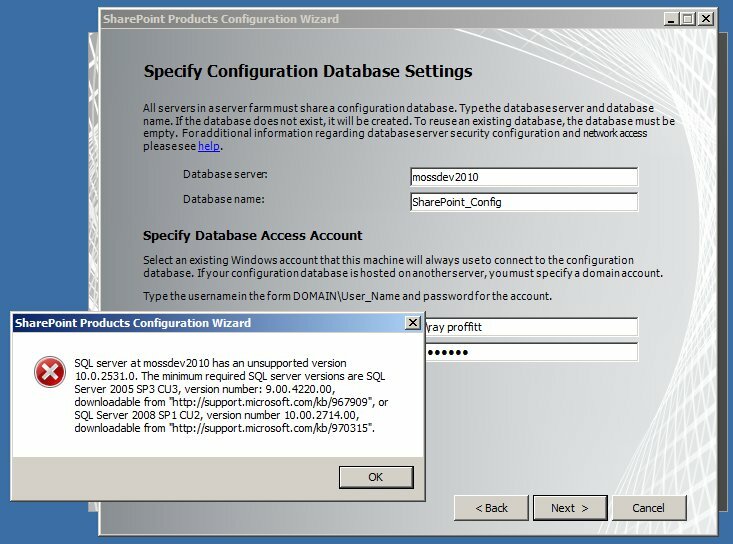 I was recently tasked with Exporting a SharePoint list to Excel for users logging in using Forms Authentication. I scratched my head for a minute and I came up with creating a Reporting Services report that queries the SP DB directly. Issues: I wanted the query to be dynamic and use the exact same SP columns. So if a user adds a field or changes a column name I don't need to amend the SSRS report. Solution: I created a Stored Proc, that takes 1 parameter (ListID). The proc gets the fields for the list then builds a query and executes it. The Stored Proc needs to reside on the same Content DB. It only looks at the Title of the lookup list/user, and then only on custom look up. Today we live in a post "credit boom" era... we've spent the last 2 decades inebriated with cheap or even free credit. And like an "all you can eat" banquet, we've had little respect for the credit we used. Now change has been forced on us and we must adapt. After a recent company memo about improving the business and compulsory annual reviews; I decided to do some research in to ways of improving my effectiveness as a manager and the best way is usually to look at what the best of the best have done in the past. In my quest for the best of the best I came across William Edwards Deming (you can google his name for more info). a. Eliminate work standards on the factory floor. Substitute leadership. b. Eliminate management by objective. Eliminate management by numbers, numerical goals. Substitute workmanship. b. Remove barriers that rob people in management and in engineering of their right to pride of workmanship. This means, inter alia," abolishment of the annual or merit rating and of management by objective. I thought I would share this tid-bit. I created 2 web parts for aiding the redirection of users to specific area I would like to share with y'all. 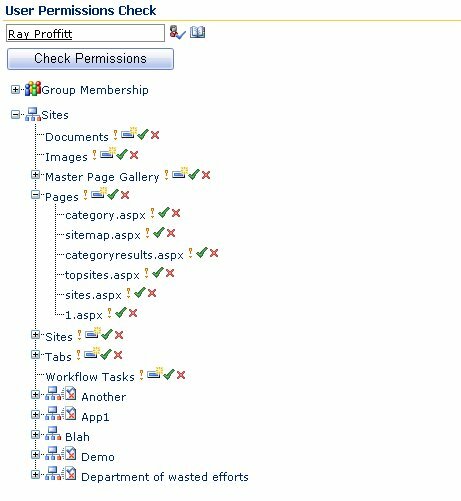 Group Page Redirector; this has a group property, a URL and redirect once property. 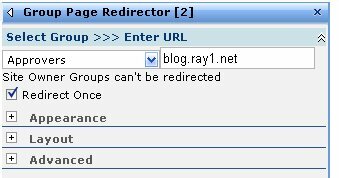 If you belong to the selected group it will redirect you to the specified URL. This can be handy if you want to show specific content to a group; like an announcement or terms and conditions. Just add more web parts for other groups. SubSite Redirector; this doesn't any properties... it just checks which Sub Sites you have access to, and if you only have access to one it will redirect you to it. They're both simple Web Parts with the source/project code and wsp. Also you can set them to Minimized and no Chrome, so that they're not visible. 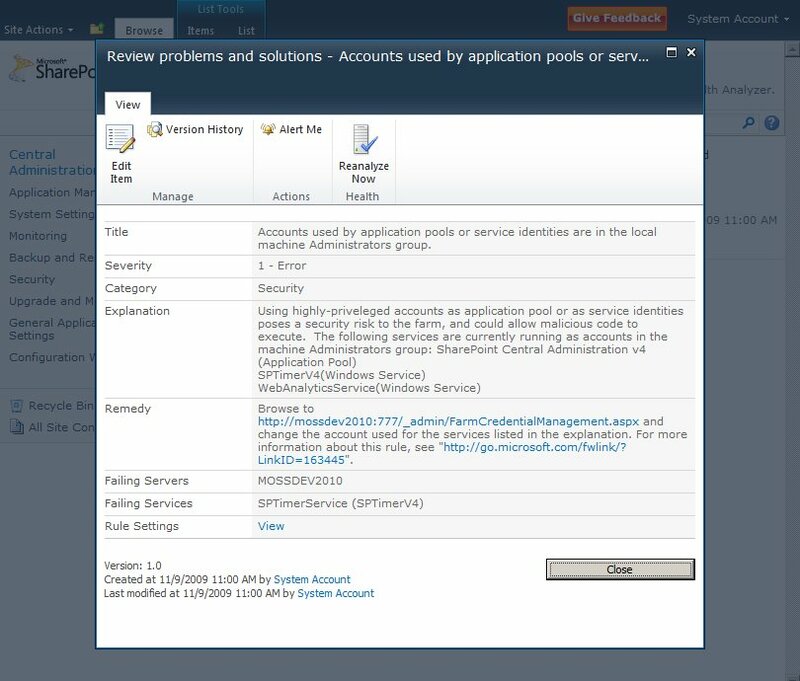 So you want to know what a specific user can and can't see in your SharePoint site?... well for that you'll need to perform an eye examination. OK really you want to know what items/list/sites for which a specific user has access? Well believe it or not you can't with the standard SharePoint tools, but it's a fairly simple exercise to create a web part that does, and to save time here's one I made before. I show an icon for SPBasePermissions instead of the usual Full Control, Contribute, ect. The tree goes down to items, but won't fetch them until you click on the list expand icon to aid performance. Since I'm using SPUser it also works for forms authentication. If you don't have permission to check permissions on an object you can set a web part property to show this or not. In any event the whole project source is included, so feel free to play and recommend changes. I mostly work with Virtual Machines and I like to pre-allocating the disk size. When I created my VM I figured 10GB would be enough for C:\ with Win2003 Server and a couple of SDK's and if I needed more I could always add another drive. I was wrong. After 2 years my faithful Win2003 dev VM is out of space on C: and I can't shuffle any more files around. My C:\windows\installer directory is >2GB so this is my prime candidate to move. 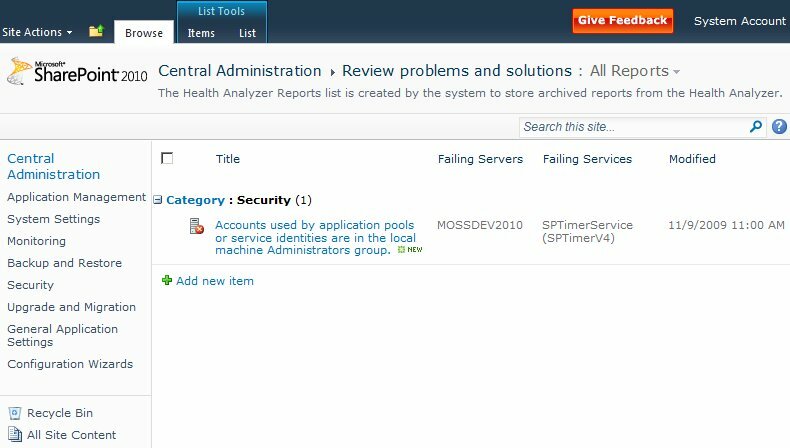 Luckily there are always solutions to problems... no I'm not going to delete the directory, or change my registry to point to a new location. I'm going to add a symbolic link from C:\windows\installer to F:\installer. That should do it. I wrote a batch (run.bat) script to do the whole procedure. This should work for most directories. The batch file should be in the same directory as junction.exe. Unable to connect publishing blob caching. Unable to connect publishing blob caching. Web.Config is not set up correctly. Cache is not valid. WebId is '1303494830', Url is 'http://vmmossdev:8088/_themes/myTheme/viewheadergrad_mt.gif'. You may see the above warning in your event log, if the "BlobCache" configsection is declared without been defined... well I did, and I google and could find a single valid explanation. So here I was checking to see if there was a new VS Extentions for WSS, and Google revealed a link to: VSeWSS 1.3 and now with x64 support... woohoo. Yeah what ever, my life is sad... but it helps us all along the way to an x86 free world. Multiply all the max values by 4 eg: maxStringContentLength="32768" ,maxArrayLength="65536", maxBytesPerRead="16384", maxNameTableCharCount="65536"